Register Log In AmbergrisCaye.com Home Forums Nature Nature Must Come First! In his article “Nature Must Come First”, published in Newsweek for December, 14 2009 the Prince of Wales said “As the world edged into financial crisis, there were repeated warnings that we were headed for disaster. In the end, disaster struck. In many ways, the challenge of climate change has a similar feel, and the alarm bells are ringing just as loudly. But while it was possible to bail out the banks and to stimulate economic recovery with trillions of dollars of public finance it will not be possible to bail out the climate-unless we act now”. In Belize the alarm bells keep ringing but are the warnings being taken seriously by the Government and the relevant agencies? In a contribution dated September 22, 2013 in the Reporter Newspaper, the Department of Environment explained that out Forestry are considered the lungs of the earth, holding vast quantities of carbon which filters the air we breathe. The forest is also responsible for the generation of rainfall and it is from within it that the water source is supplied to 45% of the Belizean population. In September 25-26, 2013, a professor Bhawan Singh Ph.D. of the University of Montreal, Canada, conducted a workshop to assess the potential impacts of climate change. He presented a series of scenarios and methodological for assessing the current impact and projected the future effect of climate change in various sectors of Belize. Our own man of the soil, Dr. Kenrick Leslie, and members of the five Cs (Caribbean Community Climate Change Center) brought the importance of understanding climate change, future effects and methods of mitigation to the forefront on Krem’s Wake Up Belize and possible other TV talkshows. However, he drew concern, reporting the “inertia” and the laggard reaction of the Government in respect to climate change and the effects it poses to the “jewel”. The Government and tourism developers have been advised to refrain from investing in mega resorts such as the Harvest Caye project and the Puerto Azul endeavour, and to direct their concentration on inland tourism packages including jungle tours, exploring the cultural attraction of Belize’s Mayan sites. The Maya are considered culturally the most advanced society (or among the most advanced ones) prior to Columbus’ arrival to the Americas. Climatologists and paleoecologists have evidence that climate changes (drought) did contribute to the collapse of the Maya. Scientists have published in the journal Nature GeoScience, subsequent to conducting studies of a stalagmite found in Yok Balum Cave in Belize, that the country experienced a drying trend since 1850. It is also within the ambit of their findings, and told by lead author Harriet Ridley of Durham University, that a prolonged drought was responsible for the collapse of the Maya in Belize and Meso-America. Historical facts submitted by Eric Thompson (1954) reveals that by the time Columbus arrived, the Maya civilisation had long been in a state of decline and only a shadow of its former glory remained. The period from 900 A.D. to the time of Columbus, arrival six hundred years later is considered by historians and archaeologists to be the post classic period of the Maya civilisation marked by its collapse and decline. Throughout its decline, as Thompson points out, several chiefdoms or city states continued to exist well into post-Columbus time. Although Maya warfare and its tribal conflicts contributed to the collapse of Maya civilisation it was climate change and a severe drought that were the main causes of the demise. In Jared Diamond’s “Collapse – How Societies Choose to Fail or Succeed”, he pointed out that the Mayas were the greatest contributors to their own downfall. They “did damage their environment, especially by deforestation and erosion”. Their form of agricultural system was based on slash and burn (swidden agriculture) in which the forest is cleared and burned, crops are grown in the resulting field for a year or a few years until the soil is exhausted and then the field is abandoned. The Kings and Nobles failed to recognise and solve these seemingly obvious problems which undermined their society. Their leaders’ attention was evidently focused on short-term concerns or enriching themselves, waging wars, erecting monuments, competing with each other, and extracting enough food from the peasants to support all those activities. Like most leaders throughout human history, the Maya Kings and Nobles did not heed long-term problems, insofar as they perceived them. They did not heed the alarm bells warning them of the incoming collapse. The sober fact is that a great part of this demised population lived in Belize, evidenced by our many Mayan sites. The historical and scientific deduction on the fall of this once great society should be the impetus for the Government and the relevant agencies to sincerely tackle the issue of climate change. The history of our forest, its problems and negative impacts it had on the environment, should accelerate the drive in mitigating climate change. However, the wanton pillaging of our forest and continuous incursion by Guatemalan bandits continue devoid of any practical solution. The scandalous felling of our precious rosewood and Minister Lisel Alamilla Pennell’s alleged collusion in her Ministry, notwithstanding a moratorium was set in place, the haste at mega-resort development and oil riggings propping up all over the jewel speak volumes regarding the Government’s stance on the issue of climate change. Similar to the Maya Kings and Nobles the Belize Government’s focus is on the short term concerns of the capital interest. The Government has failed to understand “that the economy is a subsidiary of nature and not the other way around. Nature is after all the capital that underpins capitalism”. Capitalism and the benefits of economic ventures have become one of the root causes of deforestation in Belize and the rest of the world. However, financial rewards have become available to countries like Belize in reducing deforestation. Belize has become qualified for funding from both the European Union and the Global Environmental Fund (GEF) to mitigate the effects of Climate Change. GEF is backing two projects, one of which is “Enhancing Belize’s resilience to adapt to the effects of climate change”. Additionally, a $60 million loan was secured from the World Bank to the Government of Belize regarding a project called Belize Climate Change Resilient Infrastructure Project (BCRIP). This initiative seems duplicitous to the project mentioned above being funded by GEF. BCRIP’s purpose is to strengthen various infrastructures against anticipated impacts of climate change. Several sections of roadways, culverts and creeks have been earmarked for these monies, which sounds like normal responsibilities of Central Government and municipal bodies and areas through which this project will be engaged. In my opinion, the areas earkmarked for these monies spell total nonsense. Scientific and historical facts illustrate that Belize and the rest of the world’s resilience to future effects of climate change will depend first and foremost on how we protect and manage our forest and its surrounding ecosystem. The Chiquibul Forest Reserve deserves immediate attention and efforts towards conservation; more so than any roadways, culverts, and creeks. A practical venture is copying the idea of “eco-lodge” as found in Peru’s Madre de Dios rainforest. These eco-lodges are responsible for the eco-tourism boom in Peru, catering to tourists wanting to experience a few days of nature in the Amazon. The Chiquibul Forest Reserve could create a touristic boom for Belize. The community working at the Chiquibul could become the conservation watchdog with the capability of the venture generating immediate cash flow and creating a livelihood for many. 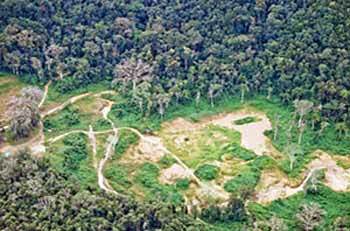 We must be cognizant that it was the destruction of the forest and land erosion which contributed to climate change and the collapse of the advanced society – the Maya. The forest are the lungs of the earth and I must agree that Nature must come first.